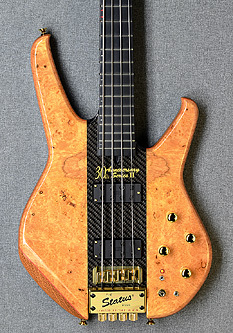 statii.com: For all things Status-Graphite - Discussion Forum: SI Classic Deluxe - 4 String - Value now? SI Classic Deluxe - 4 String - Value now? Anyone got an opinion on the the current value of a 4 string S1 Classic Deluxe - early 2000's? It's a bolt-on graphite neck with gold hardware and maple top. "As new" with case. New cost in 2000 was £899 (with chrome hardware). For some reason (not size or file type) I'm not able to attach brochure pic, but it's in the brochure section under S1 Classic. Don't mean to be a pedant, but do you mean an S1 Classic Deluxe? Yep Harry, thanks for pointing that out . . should indeed be S1!